Five words. "I guarantee we'll win tonight." And then what did the greatest captain of any sport, of any time period, do? He only goes out and scores a hat trick on Martin Brodeur and the New Jersey Devils in Game 6 of the Eastern Conference finals in 1994. Later this evening, my all time favorite hockey player, Mark Messier, will have his jersey retired by the Edmonton Oilers as they face Wayne Gretzky and the Phoenix Coyotes. For those of you who are not hockey fans and may not know who Mark Messier is, he is most known for his glaring stare and unmatched leadership skills. I recently posted about the fact that Yahoo may be seeking new leadership, maybe they should look to Messier for inspiration. He won five Stanley Cups in Edmonton and carried the New York Rangers to their first Stanley Cup in 54 years when they won hockey's greatest prize in 1994. The Rangers retired Messier's jersey last year. This guy lead on the ice and he lead in the dressing room. The stories are endless. From the playoffs in 1981 when the Oilers upset the favored Montreal Canadiens where a 20 year old Messier fought Canadien great Larry Robinson... to the '94 playoffs where Messier guaranteed the victory, this man carried teams on his back. In his 25 year career, Mark Messier played 1,756 games scoring 694 goals adding 1,193 assists for a total of 1,887 points. Not only could he score, but when required he took the law into his own hands compiling 1,910 minutes in penalties (that's equivalent to spending 31.83 full games in the penalty box). He is the second all time leader in points in the NHL. You want to learn about leadership, take a look at Mr. Messier. In any business, you need leadership. 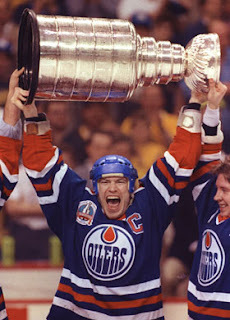 Mark Messier personified leadership. For my money he was the greatest overall hockey player of all time. You can take Gordie Howe, you can take Bobby Orr, or Paul Coffey, or you can take Wayne Gretzky... I will take Mark Messier. Congratulations to Mark Messier and his family. Enjoy the day. The "Moose" as he was known as, will always be Edmonton's favorite son. Yahoo Calling for New Chairman and CEO?